Featuring an extremely accessible motor release and height adjustment controls, as well as an ultra-powerful and low-noise 2-1/4 HP motor with superior electronic feedback (10,000 - 23,000 RPM), the Porter-Cable 894PK offers precision for superior results. Soft-starting, 12 Amp motor features full-time electronic feedback that maintains motor speed through the toughest applications and the GripVac™ handle and plunge base both offer through the column dust collection for efficient chip removal and improved bit and cut-line visibility. Brass post busing ensures durability, while a dust collection insert helps improve visibility and keep your workspace clean. 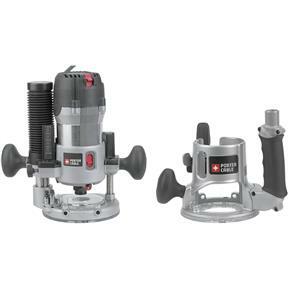 For added convenience you can replace bits with one hand, a bypass control makes larger adjustments, and an easy-to-use knob tackles more precise and minute alterations to 1/128-inch. Depth rod with 6-position adjustable turret enables stepped or repeated plunge cuts. The 894PK works with most 890 and 690 router series bases and comes with a helpful CD-ROM that breaks down the process of constructing a work table, a carrying case with plenty of bit storage, a transparent sub-base, 1/4-inch and 1/2-inch self-releasing collets, one wrench, dust collection insert, and GripVac handle. VacGrip attachment has a palm grip support, dust sealed switch through the top dust collection. Kit includes: 1/4" collet, 1/2" collet, collet wrench, GripVac™ handle, two carrying cases and operating manual.